My step-sister-in-law (can we use that term?) must be thrilled for her sister Mylène for getting this fantastic help after having flipped over during a storm and losing a few supplies. What a fantastic trip she is on! Go, Mylène, Go! Tu es capable! Lone rower Mylène Paquette sent a message of thanks to Cunard’s Queen Mary 2 today after the liner came to her aid with a package of supplies. 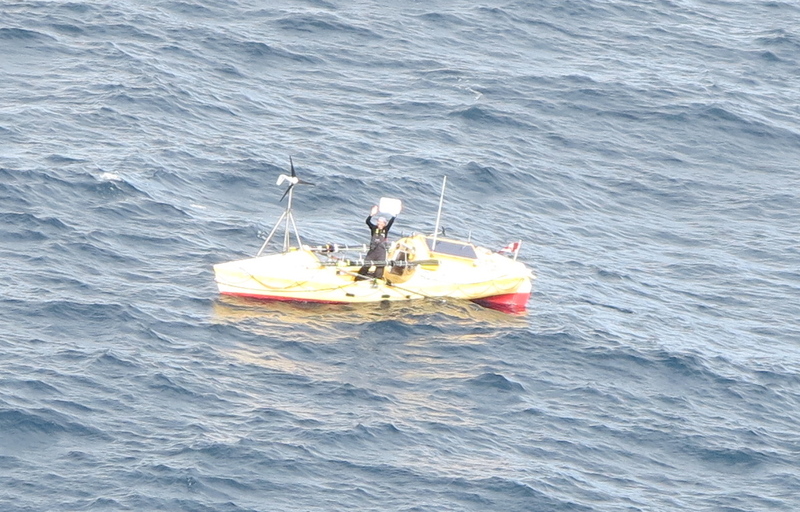 Mylène, who is halfway through her 2,500-mile attempt to cross the Atlantic from Halifax in Canada to Lorient in France, was greeted by the cheers of hundreds of passengers as she was sent a buoy carrying a replacement satellite radio, a sea anchor to maintain her position at night, as well as fresh fruit, vegetables and toiletries. The 150,000-ton ship came alongside Mylène in her seven-metre boat as she entered her 83rd day at sea. Later, she told her control base the rendezvous was ‘the best day of my life’.